The tea symbol in Chinese writing is 茶hand is pronounced cha. It is the same pronunciation as查 (cha) which means search. Tea originally received its name Cha from a legendary story. Four thousand years ago, a man named ShenNong was the first person to discover tea. He was also the first person to establish agricultural and original Chinese herb medicine in Chinese history. The legend says he had a clear stomach. One day when he swallowed the tea leaves, and then saw the tea inside his stomach going back and forth it seemed like it was searching. Thus, the name of tea is cha. Since then has existed as a beverage for over four thousand years. In the 1600s tea started spreading all over the world. Today there are over two billion people who enjoy tea around the world. Every year about 2,500,000 tons of tea is consumed worldwide. China is one of the biggest tea producing countries and exports about 300,000 tons of teas yearly to over 110 different countries. The qualities of the Chinese teas are so high that countries like Japan, India and Sri Lanka will import them to blend with their own teas. The purpose is to upgrade their teas quality and then export it to another country such as America. Last month, I gave a public speech about tea at the Tucson Chinese Culture Center (TCCC). People asked me a lot of questions about the health benefits of tea. One lady told me that she didn’t feel any better after drinking green tea every day for the last two years. She was questioning whether to continue drinking tea or stop drinking tea. I asked her why she drank tea and how did she prepared her tea. She has high blood pressure, and she read in a news paper that green tea would help reduce high blood pressure. She didn’t need to prepare her tea because it was already made and came in a gallon jar at the grocery store. Perhaps she is an average knowledge American tea consumer. The most fascinating thing about green tea discovered from scientific studies is that it has polyphenols that compounds with antioxidant activity that may protect against heart disease and a variety of cancers. Also some studies reported that green tea could help to reduce high blood pressure and even recommended drinking tea to lose weight. But these fantastic tea polyphenols are not only in green tea. XiaoChun Wan is the President of the Agricultural University of Anhui in China and is also the editor of the school text book ‘Biochemistry of Tea’. He confirms that many verities tea contain tea polyphenols as well, also tea contains catechins, flavonoids, carotenes, varieties of minerals, varieties of acids and caffeine. The oxalic acid can combine with protein that from meat or fish in our stomach and together produce calculus oxalate which is not easy to digest and can create a kidney stone. Therefore, we shouldn’t drink tea during our meal or right after a meal. At least we should wait 30 minutes to digest then drink tea. For those people who already have calculosis such as a kidney stone they shouldn’t drink tea at all. Because tea contains caffeine, so it is not a good idea drink tea before you go to bed; strong tea is not good for pregnant women because the stimulation of caffeine can hurt fetus, yes I mean any kind tea. ShiZhen Li was a famous TCM doctor in the Ming Dynasty. He believed drinking tea depends on a person’s body type, and the season of the year to decide if tea is good for a person to drink or not. Depending on the Yin and Yang value and balance in a person’s body they need to consider what food and drink match their body type. You can go any TCM doctor to find out your body type by them checking your pulse, tongue color. Green tea is a Yin type product that produces a cooling energy for the body. If a person is a yang type then their body contains more heat, and drinking tea can help to cleanse the heat poison (usually cause exanthema or rash) and balance the Yin and Yang. If a person has a Yin type body it is usually weak and cold and drinking green tea will make them feel colder. For those who are a yin type body person may consider drink black tea with cinnamon that helps grow warm energy to their body. Today tea in China has been categorized into seven groups. The Green tea, White tea, Yellow tea, and light (or green) Oolong teas are Yin types that provide cooling energy. These teas are good for the Yang type bodies. Black tea, cooked Pu’er tea and dark Oolong tea are the Yang type teas that are better for Yin body types. Therefore, you should know your body type first before you even start drinking tea. The best season for most tea is spring. The tea bushes are fully bloomed in the end of March or beginning of April. Tea bush pass through a whole winter time use its roots absorb nutrition from the ground, until spring tea bush starts sprout new buds and then leaves. If we take a look about how the nourishment distribute in a tea bush, we will understand why the quality of tea is so important. From the top bud to the bottom of a tea bush, the 20% of nutrition stored in the bud, the first leaf contains 24% and the second leaf contains 23%. That is way some tea company label their tea is one bud two leaves to indicate the highest quality. Otherwise when the weather gets warmer and the tea bush start grow fast, tea leaves will lose nutrition, and meanwhile the heavy metal contents such as chromium increase in the bottom leaves. Those heavy metal contents are not good for human’s body. This fully proved the first tea books theory about that if the tea is picked at the wrong time of year and, processed in the wrong way that it will make people sick. So the best season for tea is spring and the best quality is picking the top one bud with two leaves. People like to compare wine with tea because their similarities such as how the quality influences the price and how many different varieties they are. If you can experience the difference between drinking a hundred dollar bottle wine and a three dollar bottle then you will understand why the quality of the tea is so important. The rich aroma that fills the nose while relishing the taste in the mouth, and enjoying the soothing effect of the tea your body feels are all reasons why people love a hot cup of tea. Unlike wine, the lower quality wines still are drinkable, but bad quality tea is not. When I heard the lady at the TCCC say her tea was already made and came in a gallon jar I felt that she drank some mixture of stale green tea with antiseptic chemicals and sugar. I showed her a freshly prepared green tea. It is so simple to prepare, you just need a clear glass cup, add about 3 grams of fresh green tea and then add a little hot water just cover the tea. I passed the tea to her and told her to smell it. She was surprised. She said, “This is amazing, it smell so fresh and floral.” I asked her to pass the tea back to me, and filled up with hot water set aside for demonstration. I prepared another glass for her so she can experience the difference with her tea. 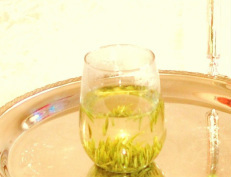 During the speech, people witnessed the tea oxidized, its color from a light clear green turned to yellow, and then from yellow to a dark brown. Think about it, the company that bottles the prepared tea must add some antiseptic chemicals if they intend sell the tea before its expiration date. Also because bad quality teas are very bitter they will need to add some sugar to make it taste better. These companies are quick will point out the health benefits of tea without mentioning that the antiseptic chemicals and sugar added to the drink will negatively affect the body. If we say that wine is like a young boy and girl in love then tea is like a happily married couple. Wine is sweet and full of romance and passion. It is like a young couple falling in love. Tea is like the happy and healthy love that leads to marriage. We have to know ourselves first and then pick the right person to marry. Like marriage, if we pick the right tea it will bring a lot of health benefits to our body and happiness to our life.